Osteoarthritis of hands, also called rizarthrosis, usually occurs in people over 65 years of age. It affects approximately 64-78% of men and 71-99% of women of this age. The presence of osteoarthritis in the hands of a person is strongly associated with an increased risk of degenerative changes in the knee or hip area.The genetic factor plays a large role in the onset of hand osteoarthritis, as in the case of osteoarthritis of the knee joint. Did you know that low levels of synovial fluid are the main cause of inflammation in the joints? 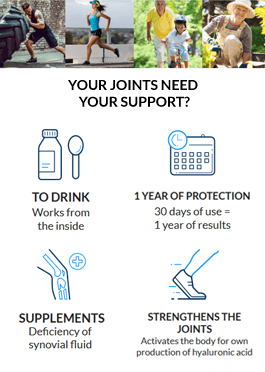 Did you know that Hyalutidin HC Aktiv, thanks to a strong dose, provides protection to all your joints? Nodular form is characterized by occurrence of prominences which cause deformities. This is the most common form , in which Heberden’s nodes often appear in the distal interphalangeal joints and, less frequently, the occurrence of Bouchard's nodes in the proximal interphalangeal joints is observed. These nodules may become enlarged, causing pain and further deviation of the phalanx in relation to the long axis of the finger. This form most commonly affects women and it is often observed to run in the family. Rhizarthrosis pollicis is a term referring to the degenerative changes occurring in the carpometacarpal joint of the thumb. The distinctive feature here is a bayonet shape of the finger, as well as swelling, pressure pain and crackling during movement. Erosive hand (manus artrhosis erosive) this is the third form of the hand osteoarthritis. The erosions most frequently occur within the Heberden’s and Bouchard’s nodules. The damages are very similar to those developing in rheumatoid arthritis. Deformations that occur in osteoarthritis of the hands are frequently related to the second and third finger joint. Despite it all, they are more pronounced in the dominant hand of a person. Did you know that Hyalutidin HC Aktiv contains as much as 450 mg of hyaluronic acid and chondroitin sulphate in the daily dose? The whole 30-day package contains as much as 15000 mg of the complex. An important role in the prevention of osteoarthritis is nutrition. The diet should be balanced and provide the components needed to build cartilage. It should also avoid foods that worsen arthritis. Exercise is not only an excellent form of prevention for arthritis. In addition to changes in pressure within the joint thank to movements, we nourish the cartilage and reduce pain. Doing recommended exercises on your toes so as to increase the flexibility and strengthen the muscles around the small joints of the hands is also recommended. The exercises are very simple, but require the patient to be systematic. It is best when we introduce these good habits into everyday life - it really makes a huge difference in the comfort of movement and well-being.